I consider myself lucky for being able to go to work by bicycle every day. I work just across the city center. 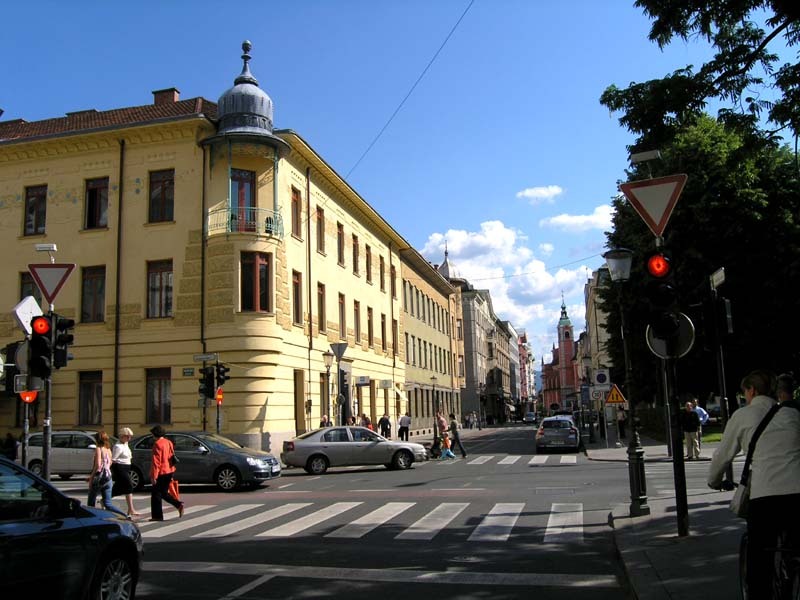 Because Ljubljana (the capital of Slovenia) is a relatively small city, it is not very far. It's about a 25 minute ride each way. It takes me a little less in the morning (I am always in a hurry) and a bit more in the afternoon (I usually take time to enjoy the city center beat). From time to time I take my trusty camera with me. There is always something that catches my attention. Sometimes it's an interesting detail on one of many old buildings I haven't noticed before and sometimes it's a hot babe strolling by. Well here are some of the photos from the other day. Enjoy! It has been some time since I have posted about the bunny nursery project (actually it was just two posts back). I think the only right thing to do is to finally share some info on the subject. 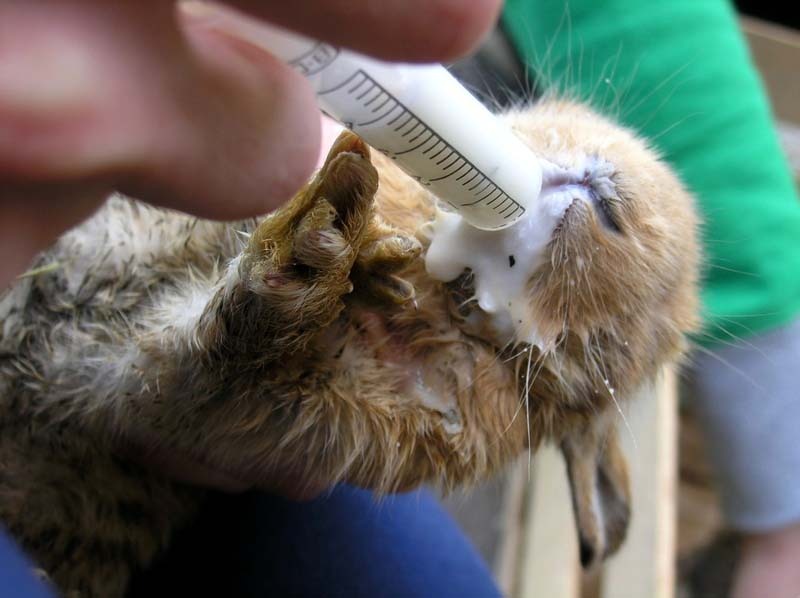 Every day since my post the little orphan bunnies had a couple meals of goat milk. We didn't know this until recently, but the only two appropriate kinds of milk for little bunnies are supposed to be goat and cat milk. It has been purely by chance that we have used goat milk. Lucky little bunnies! Well to be precise, only some of the lot. As you probably suspect by now, I have to tell you that not all of them made it. That's life. After five days or so, four of them just stopped moving. We were sad, but have been expecting something like that. Then after another couple of days another one went to bunny heaven. That leaves us with four of the nine little bunnies. Now they also like to eat clover and have also learned to drink milk from a special container, so we don't have to hand-feed them anymore. You can see one of the four musketeers on the photo below. Quite a change from two weeks ago, isn't it? It is still not certain that these remaining four will live to grow up, but I guess their chances are better every day. Or to be more precise - the Jackpot hit me! My girlfriend's sister has been working for the same company for ten years now. As it happens, this year has also been fifteen years since the founding of the company. So for the occasion the Big Boss decided to be generous. For the most loyal employees this meant a 4.000 EUR bonus in a form of a voucher at one of the local travel agencies. Hooray for the Big Boss! After sharing this news with my girlfriend, her sister has decided to invite both of us on a holiday. We tried to persuade her that this is far too much and that she should let at least one of us pay for himself. She wouldn't hear anything of the sort. To be honest, we didn't try too hard. But who could blame us, right? So as it seems, Egypt will be our destination for two weeks this August. Can you believe it? I still can't. And we didn't even buy a lottery ticket! You can expect some really cool photos of pyramids and lots of sand in two months time. I can hardly wait! 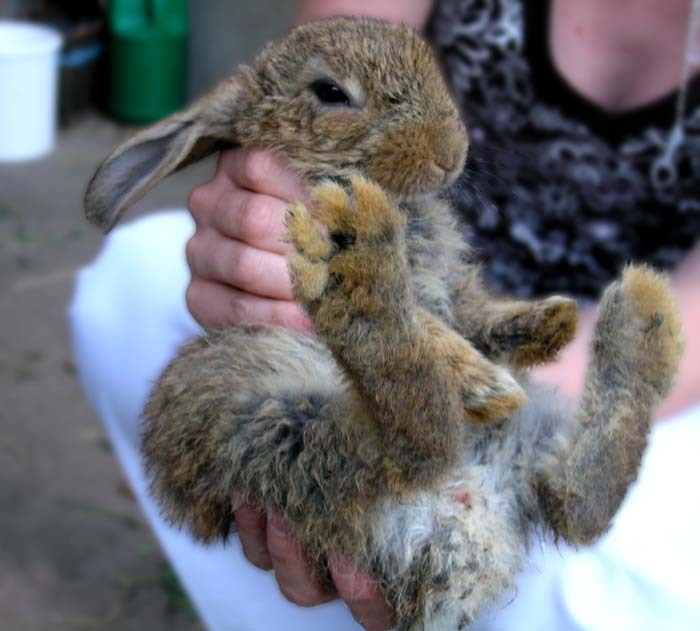 I don't know if there is anything cuter than young doggies, kittens, bunnies and similar little fur balls. Well this post is obviously going to be about bunnies! If you are wondering how the nursery fits into this story, you will just have to read along. Usually I go visit my grandmother every couple of weeks. She doesn't really live on a farm, but nonetheless has a dozen chickens, five hares and a goat. That would be way too much work for me, but she seems to enjoy every minute of the work. 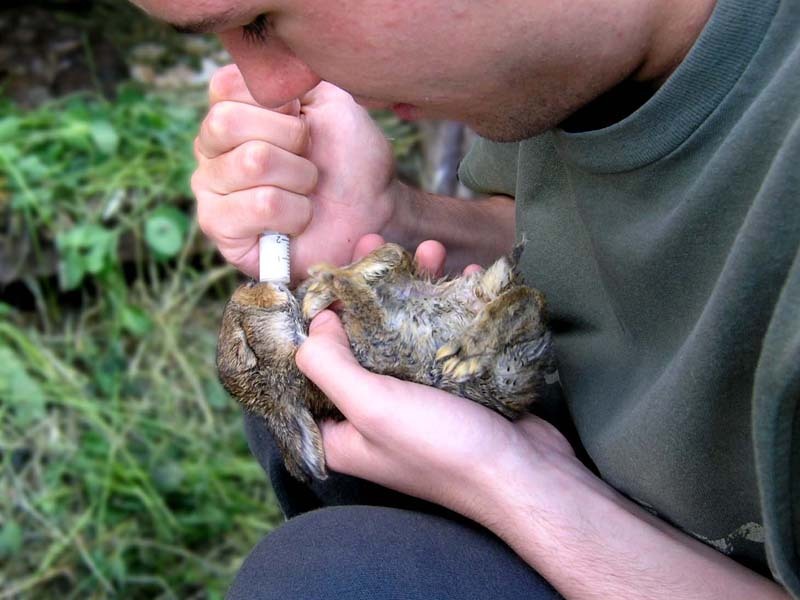 About two weeks ago one of the female hares has brought forth nine young ones. After a couple of days the goat followed with two, but unfortunately both of them were stillborn. 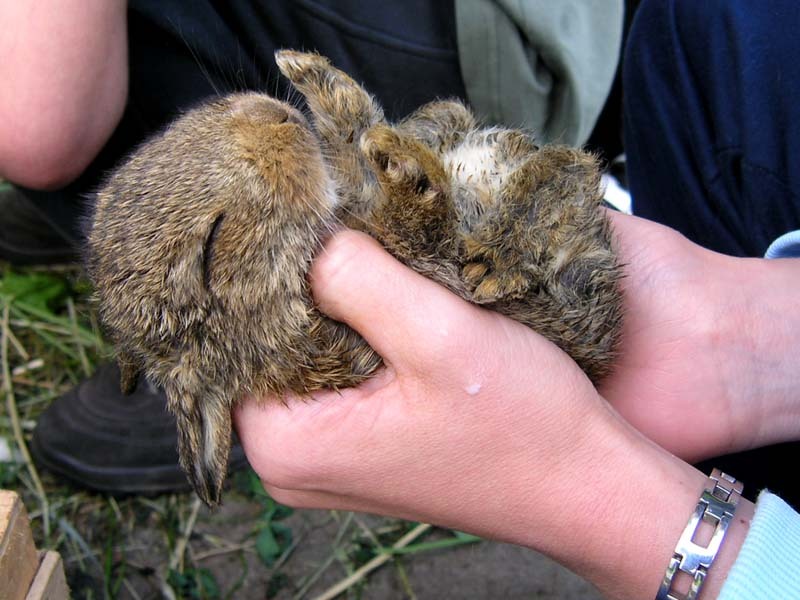 Early the next day mother hare started to act weird and died later the same day leaving behind nine little bunnies. They were still very small, with their eyes not quite opened yet and of course they also couldn't chew any food yet. Fortunately my younger brother came up with an idea. He persuaded our grandmother to milk the goat and then he tried to feed the milk to the little bunnies. He took them in his hand one-by-one and they sucked on the improvised teat like crazy! That wasn't so strange, because I'm sure quite some time has passed since their last meal. After the initial success he repeated the routine for two to three times each day. After a few days they seem well. I'm glad they all lived through their first obstacle in life, but still I'm not sure all of them will make it till they learn to chew some proper food. That's because some of them are growing at a slower pace. It is a real pleasure to see them grow on a daily basis. They really are getting bigger every day. However things turn out, I'll try to keep you posted. I have had an Agloco link on my blog for quite some time (the hot babe in the right column), but haven't published a post about it. The time seems just right to do it now. After much anticipation Agloco finally released their Viewbar a few days ago (until now this was a missing link between signing up and starting to earn some surfing money). If you have already registered for an Agloco account, you can login and download it now. If you don’t have an Agloco account or have misplaced your login info, you can sign up here. If you don't know what I’m talking about and who or what this Aglogo thing is, read some info on the subject. In a few words: Agloco is a service that intends to help you earn money from your regular web surfing. These last days their site was too busy to get through — they warned this might happen. If you can’t get through to their site, just try again later (I succeeded on my third try two days ago). I installed the Viewbar under Windows 2000, and so far it seems to be running just fine. I’m pleased with how thin it is. It stays at the bottom of the screen, just above the Windows Taskbar. I think after a few minutes of use you won't even notice it. So far it seems to works fine with both Internet Explorer and Firefox (I haven't tried it with any other web browser). I can't really say I have tested the Agloco Viewbar in detail, and since no one has earned anything from this it so far (it is a fresh thing really), I’m not endorsing this service. But I think it's interesting for several reasons: A) It’s free, B) it’s interesting enough to deserve your attention and C) it's zero risk trying it out for a while to see if it works. If you think Agloco is totally not worth your attention, you may be right. But in the end, who cares if it doesn't work out? On the other hand, if it does moderately well, those who got in early will be glad they invested the negligible amount of time to sign up, download and install the Viewbar, and pass on the word to others. I won't be sorry for not trying – not this time. To me this was an easy decision. Due to the negligible risk, one can afford to place a lot of these bets and lose most of them. If I needed to pay any money to sign-up though, I wouldn’t even think about it twice. Consider giving Agloco a closer look if you haven’t already done so. I remembered this travel story when I was writing the previous post. When someone mentions a train station, usually people get an image of a dangerous, filthy place, with graffiti sprayed walls and a bunch of suspicious characters hanging around. Well, that isn't so even with the Ljubljana train station. I am not saying that I'd like to spend a night on one of the benches there. Not that I wouldn't feel safe or anything (I don't think much is going on there at night), but I am pretty sure that I wouldn't sleep very well. If nothing else, those benches don't look all that comfortable. 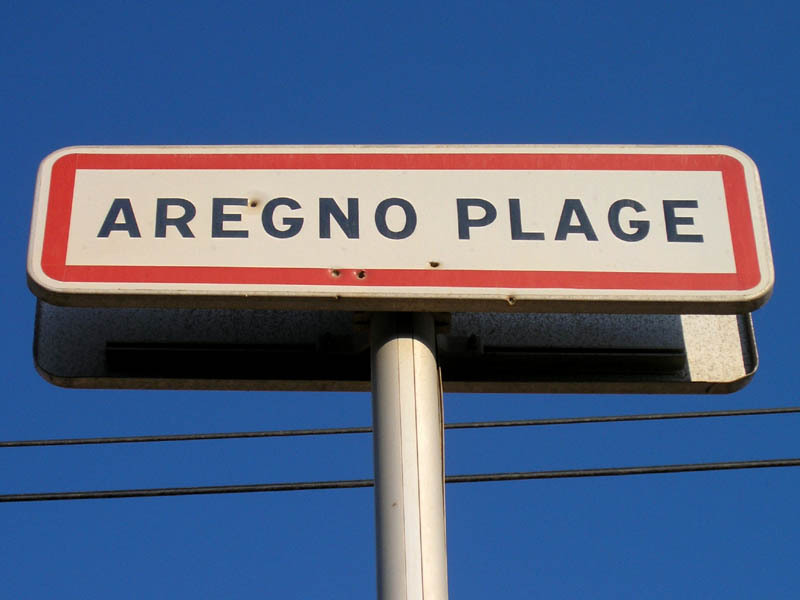 On the photo you can see a morning train stopping at Aregno Plage train station at Corsica, France. That is our tent in the front (my girlfriend is still trying to sleep - with not much effect, unfortunately). The night before this looked like just another camping site with lots of shade under the pine trees. We didn't even know at the time it was a train station until the rude awakening in the morning. Even then I found it quite nice. There was a sandy beach just over the railroad track. Have you ever wished you had a really huge toy train? How about a real train? Or maybe even a train museum? Some people just don't settle for a wish. Some of us always want the real thing! I guess this one guy living there has settled for nothing less than a real thing. 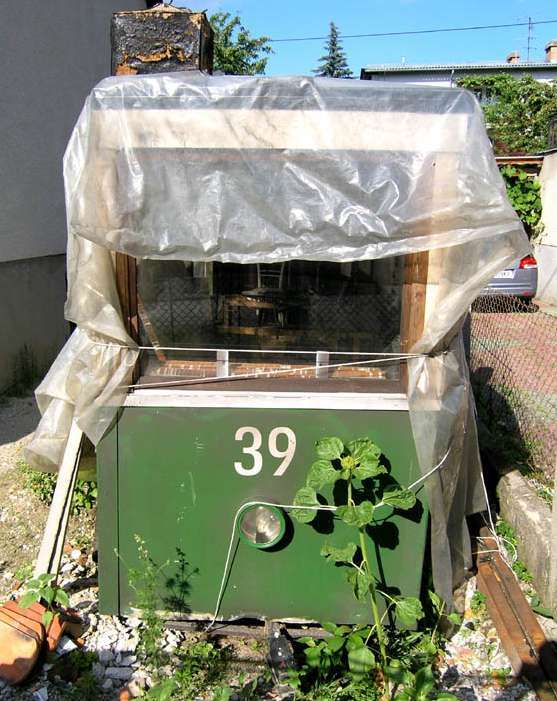 In front of his house he has the real tram wagon and two (2!) 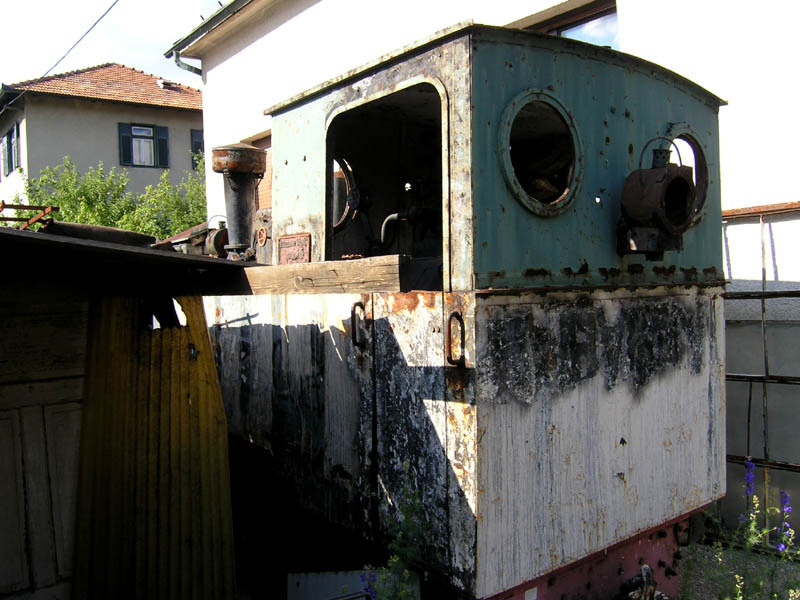 real-size old locomotives. All of which are museum material, so I guess he must feel like having a home train museum. I guess most people would say it's just a heap of old rusty rubbish belonging to a rubbish dump. 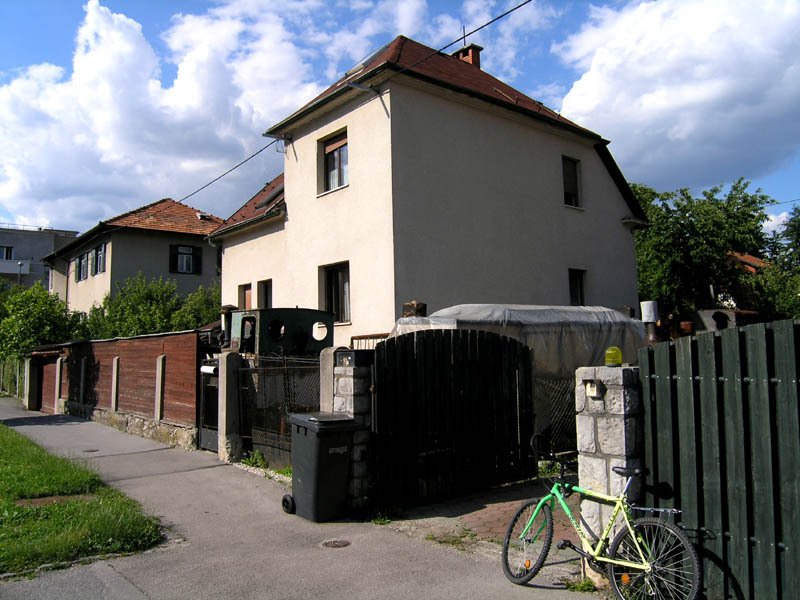 The amazing thing is that this house is located just five minutes (by bike) from the Ljubljana city center. You can walk right by the house and not even see the thing. Who would have a train parked in front of his house, right? There isn't even a railroad track nearby. Let's face it - you'd never expect a locomotive in a backyard. So I'm pretty sure most of the people passing by don't even know it is there. No matter where you go, you have to eat. Right? Right! So what can one get on his plate when in Belgrade? 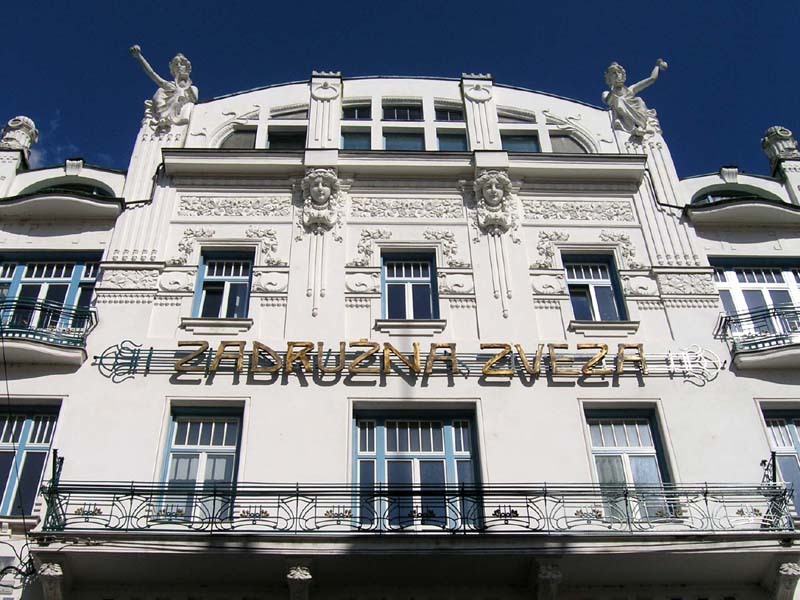 Here are a few dishes from different restaurants around Belgrade, the capital of Serbia. 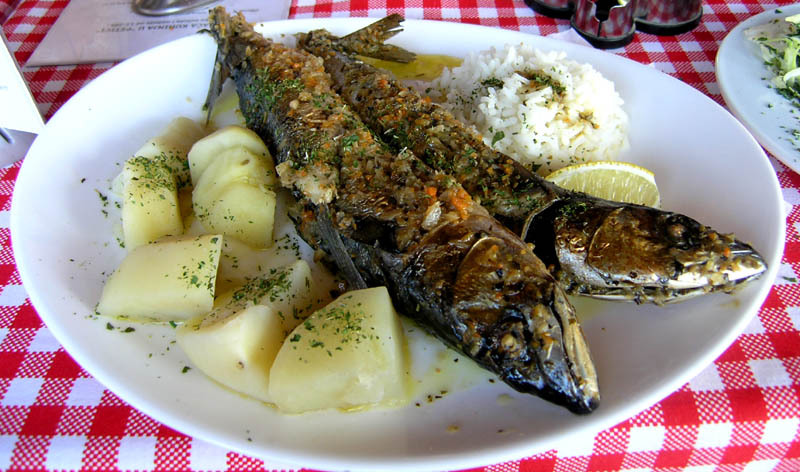 Despite of the fact that Belgrade is nowhere near the Adriatic (or any other) sea, one can choose from quite a wide choice of seafood dishes. Some of the seafood restaurants are even supposed to be quite good. (a Serbian version of a hamburger), cevapcici (or ćevapčići to be specific, are made of same kind of meat as pljeskavica, but shaped differently), burek (cheese- or meat-filled pastry). On the photo is a generous portion of cevapcici with fries. 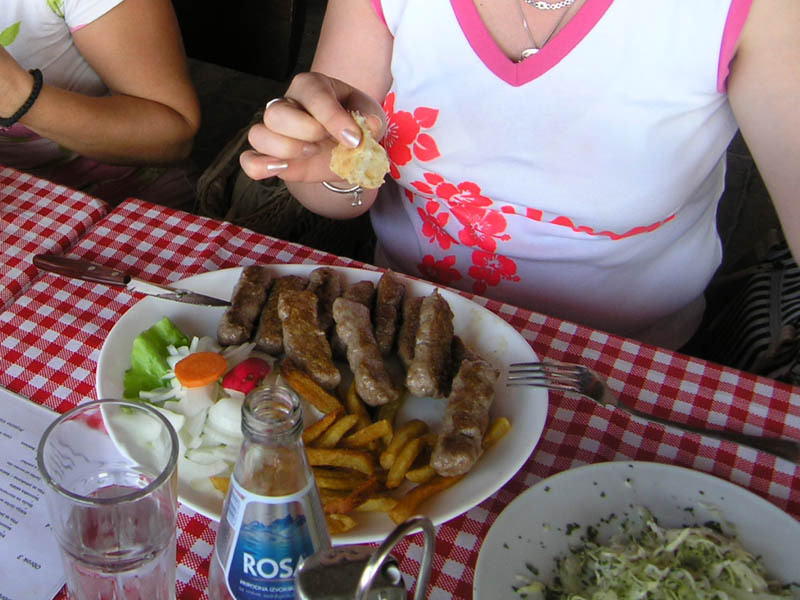 If anything, you don't need to worry about portion sizes in Serbia. Any meat dish ordered usually has at least enough meat to satisfy a hungry lumberjack. This portion was delicious. Regardless if it is a main dish or desert you want, you can stop at one of the Pancake places. There one can choose from a variety of sweet and salty pancake dishes. 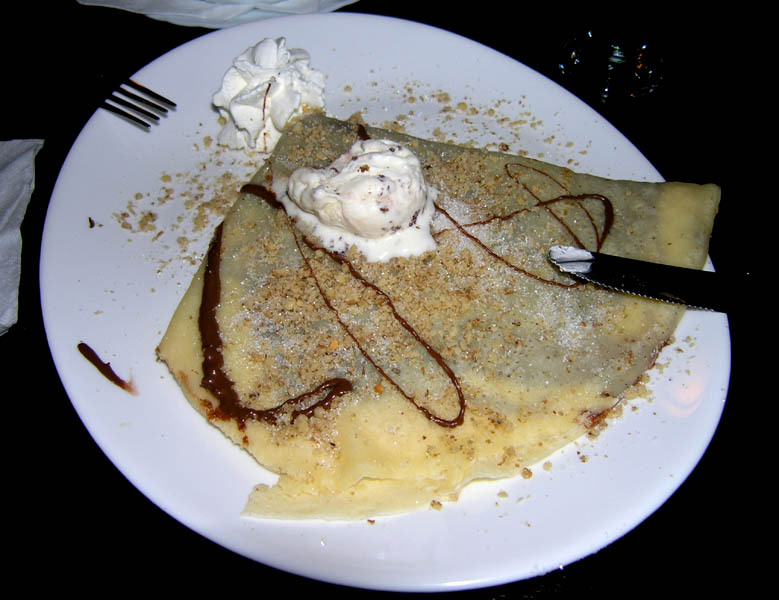 The choice of the evening was a chocolate filled pancake with walnuts and ice-cream. And it was a huge one. The salty ones looked just as good.